Then Penny is finally making herself at home. It was almost two weeks before she would stay in the living room very long. This is her stretched out on Geo's lift chair. She still won't sit on my lap unless I lift her and then she is ready to get down as soon as I let go of her. This shows her stealing a little monkey that I keep on these baskets. This is the baby that goes with the Mama that McDoanld's gave with food. She grabbed hold of it in her mouth and back the hall she went. I found it on the floor in her bedroom. I put it back where it was and she hasn't touched it since. I have been sewing other things besides the Mystery quilt. I am working on the border pieces of it now. I am going to really like it. This is a kid's Quilt I made on Monday. 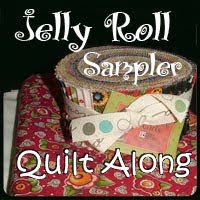 Sunday I went to my first meeting sew-in at the quilt shop and got some more kits. Also got one we worked on which is a Pinwheel but I haven't been able to figure out how she wanted it set together with the strips that came with it. So am waiting till I get together with her again. We are suppose to get some more snow tonight but they seem to be making it smaller, guess it is leaving it all in the mid-west or want to load New York and Buffalo again. Thank You for visiting even when I don't post very often. Just not enough news around here. You will get tired of reading about Penny's antics. I just love the colors of your Mon Ami piece. Something different--- not like everyoine else. The white brings out the other pieces really well. Great job. Your Mon Ami is beautiful Eileen! Great colors-so warm and cozy! Your Mon Ami quilt turned out lovely- Nice to see Penny getting more comfortable with you and your home. We have had some mild weather the last while ( around zero) and the ice has built up on the roof. Some fellows came today and cleared the roof so we hope that it will cure the drips that were happening in the house. Ah the joy of winter. 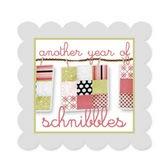 Happy quilting and stay Warm. I love your Mon Ami quilt....gorgeous!